Here is my take on VR vs AR. They are for different audiences. My son for example loves to spend hours on his PlayStation. If given the opportunity he can spend days. He stays glued to the TV except when he is nibbling on snacks to stay alive. He will love VR. My daughter on the other hand loves to play with Snapchat filters. AR will be perfect for her. I’m different from either. I cannot immerse myself in mind-numbing games. As a child I could play The addiction of Ularn or The Prince of Persia for hours on end. But not anymore. I could perhaps enjoy VR for a few minutes, and then I’m done. AR also usually bores me after a few minutes. What I like is Mixed Reality. MR. So for those of us who don’t know the difference between MR, VR and AR, here’s a quick summary. Virtual Reality (VR) immerses you into a simulated environment. You wear headsets that completely cover your eyes. A screen in front of your eyes shows you the environment you are in. You can look around and see the environment from a first person perspective. The headset also provides you with sounds. And you can interact with virtual objects in that environment. Usually you are limited to the confines of the room you are in. With Augmented Reality, the visible natural world is overlaid with digital content. Pokemon Go is a very popular example of AR. Other famous examples are Google Glass and Yelp’s Monocle feature on smart phones. AR allows you to either tap into hidden information related to the real life objects you see, or enhance the quality of your experience with additional material. Mixed Reality is similar to Augmented Reality, with the added feature of virtual objects being not only integrated into the natural world, but programmed to be responsive to it as well. For example, a virtual kitten under your bed would be blocked from view unless you bent down to look at it. In theory, MR could become VR in a dark room. But what interests me most about MR is that you can interact with the virtual objects and make them respond to you. In other words, you can pick up the virtual kitten from under the bed and put it on the bed next to you! Don’t get me wrong. Objects in VR respond to you as well. They even give you tactile feedback. In fact, one of my favorite VR applications is Google’s paint application Tilt Brush. It allows me to create something useful. But my movement is limited to the room I am in. Plus I cannot see the real world at all! I have to be careful not to bump into things. MR on the other hand frees me up to move around the world. In my opinion, Hololens is the best MR headset out there. Nothing comes close. But Microsoft has to shrink it down to the size of Google Glass for it to be really usable. As a matter of fact, this is what Google Glass should do. Instead of loading all the equipment on just the right side of the glass, they should leverage the left side as well. They should put sensors there like Microsoft’s Hololens, so that it detects my hand movements and responds to my actions. I should be able to manipulate the data or objects and interact with them like Tom Cruise does in Minority Report. 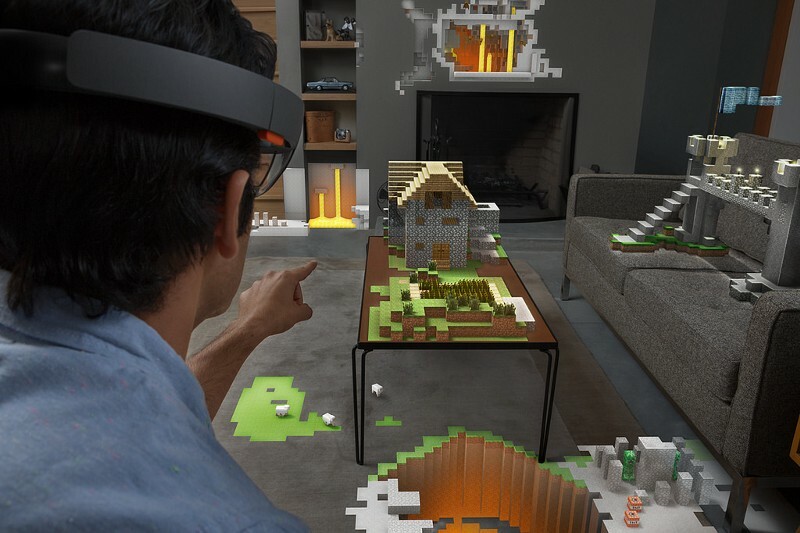 Hololens is almost able to do it now, but there are no good apps yet. Once there are useful apps that allow you to interact with virtual objects — even tabular data in a spreadsheet, with a Second Life like keyboard — MR will take off. I think if Microsoft works with Yelp for example they can make an awesome app. 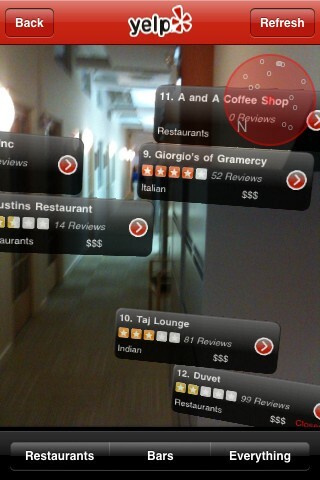 I don’t know if you have used the ‘monocle’ feature in the yelp app. When I first saw that it was mind blowing. I have not used it recently, but it is a valuable feature when integrated into hololens/googleglass/MR glasses. One drawback monocle had was that you had to hold the phone up vertically. Not a naturally comfortable position. But it is perfect for MR glasses. However, just showing us the restaurant, like monocle does, is just the beginning. To make MR really useful we should be able to see the menu once we are at the restaurant and order the food. In fact, we should be able to check in at the restaurant when we get there, be apprised of our position and wait time, and be guided to our table on a path overlaid on the floor when it is our turn to be seated. In addition to giving the MR user a great experience, MR directly helps the restaurant’s bottom line. What’s best for my small business? What should my small business use? As with all cases where you have a choice, it depends. Let’s say you work at a construction company. You can don your MR glasses and look at the area you are going to work on today. While the area is not yet built up, you can visualize what it will look like once the documented plan is executed. You can see where you will lay the wall or the girder or the studs depending on the work you are planning to do today. With your MR glasses you don’t just see what it will look like, but you can drill down into each object and see what measurements to use when you cut, drill, paste, mount, etc. MR glasses are perfect for this. Imagine you run a museum. You want to show in depth details for all exhibits, and there is no more space on the wall. You can have your patrons wear AR glasses which allow them to see additional information based on the piece of art they are enjoying. If you are an interior designer at a customer’s house planning to try on new paints and furniture layouts, VR glasses are the optimal choice. If you use AR or MR glasses you cannot sensibly “move” the virtual furniture around and unsee the real furniture that is there. You cannot unsee the existing colors on the walls. But with VR you can immerse yourself and your customer simultaneously into a simulation of the existing home, then start repainting the walls and rearranging furniture to your hearts content. 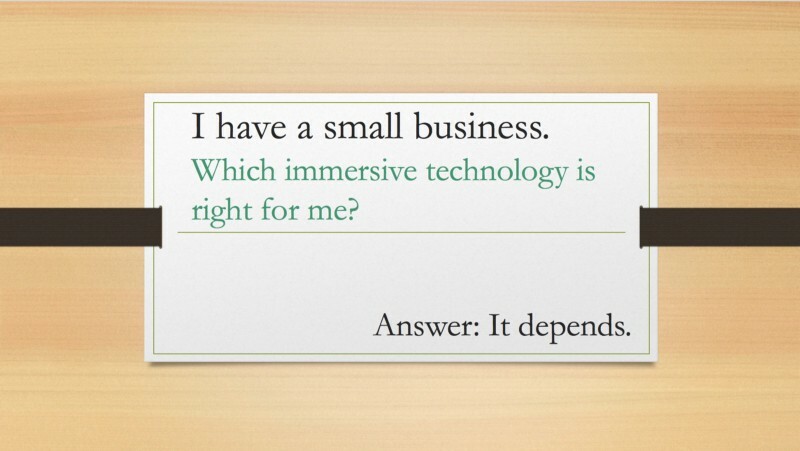 In conclusion, if you are a small business looking to use immersive technologies, do your homework. Study the use cases that will delight your customer. Then pick the technology — or technologies — that will satisfy those use cases.